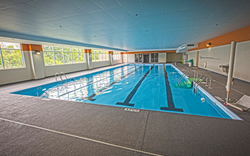 With new PHIIT classes and enhanced pool amenities, members enjoy remodeled facilities at the National Fitness Center in Sevierville, Tennessee. “Our remodel only serves to enhance the premium amenities we offer at our gym,” says Patrick Beck, general manager. “We are a full service health club with services unlike any other in Sevierville. Members of the National Fitness Center in Sevierville, Tennessee are enjoying the new services and amenities made possible by a recent facelift. A remodel of the 40,000 square foot health club made room for PHIIT (Personal High Intensity Interval Training) group classes and a smoothie bar featuring low-calorie, high protein refreshment options. Refurbished for additional comfort and safety, the indoor heated pool area now features a non-skid, cushioned surface that prevents slipping. Amenities in the pool area also include a sauna, steam room and hot tub. The National Fitness Center in Sevierville also offers clean and secure equipment and amenities that cater to every physical fitness program, age and fitness level. For example, the "ladies only gym" is the perfect area for exercise away from the co-ed crowd. Learn more about the National Fitness Center in Sevierville by calling 865.429.2400 or visiting http:// http://www.nfcgymssevierville.com/. With some of the best services and amenities in the Knoxville area, the National Fitness Center offers convenient locations in Knoxville, Maryville, Morristown, Oak Ridge, and Sevierville. Programs include group exercise classes, free weights, cardio training, indoor track, kids’ programs, personal training, and more. Learn more about the National Fitness Center at http://www.nfc1.com.